Welcome to Finnmade Finnmade Furniture Solutions specialize in the supply and installation of shelving, furniture and accessories for school, public and business libraries. We offer a selection of both timber and steel shelving systems, modular and bespoke counters, plus a comprehensive range of furniture to suit all budgets. We also supply residential, office and dining furniture. Please contact us should you require additional information or wish to arrange a visit from a company representative. 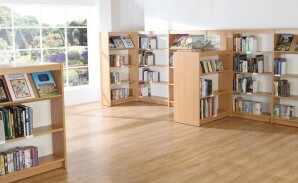 Finnmade Furniture Solutions specialize in the supply and installation of shelving, furniture and accessories for school, public and business libraries.